What Is the Average Number of Push-Ups a Male Can Do in 30 Seconds? Pushups are a long-time barometer of physical fitness. Men often challenge each other to pushup contests and movies depict scenes of soldiers, athletes and other strong men performing a grueling series of pushups as a symbol of masculinity. Many men are interested in how many pushups they should be able to perform to be considered physically fit. Pushups require the strength of the entire body, which is why they are a quick and easy test of your physical fitness. This simple, no-equipment-necessary exercise employs the legs, hips, abs, arms, chest and shoulders, according to The New York Times. It is a challenging exercise even for those who are in good shape. Most pushup tests take into account factors from the person being tested. Age, gender and time limit are often considered and the test rated accordingly. Women are often allowed to rest on their knees instead of performing the exercise on toes and hands. Older people can often do fewer pushups than younger people and that is also taken into account when figuring out an "average." Some of the standard pushup tests allow you to perform as many pushups as you can, with no time limit. Trainer Craig Ballantyne, on his site Turbulence Training, calls a man under 45 years old performing 20-34 push-ups "average." Those performing more than 35 repetitions, with perfect form, earn the label "fit." Other pushup tests instruct you to perform as many pushups as you can within a time limit, either 1 or 2 minutes. To be a Navy SEAL, you should be able to do at least 42 pushups in 2 minutes, according to Military.com. That would break down to 10.5 push ups in 30 seconds. But Navy SEALS are hardly "average" specimens of physical fitness. They are known for being at the peak of fitness. In the 1-minute version of the test, males between the ages of 20 and 29 should perform between 22 and 28 pushups in 1 minute to get an "average" rating. If you're between the ages of 30 and 39, an "average" rating requires between 17 and 21 pushups in 1 minute. Performing weight-bearing exercises in the gym can help improve the number of pushups you can perform in 30 seconds. But that is far from the only factor to consider. 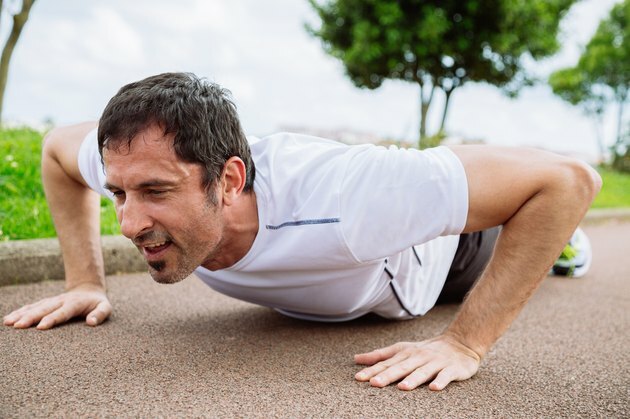 Add cardiovascular exercise to keep your endurance up and keep you from running out of breath during your pushup trials. Also, eat a healthy diet rich in muscle-building lean proteins and whole grains and skip sugary snacks. You'll be performing more pushups in no time. Turbulence Training: How Many Push Ups Can You Do? Is It Safe to Do Push-Ups Everyday? Can You Get Ripped by Doing Push Ups?